This is a nice picture for a letter identification worksheet. An island. 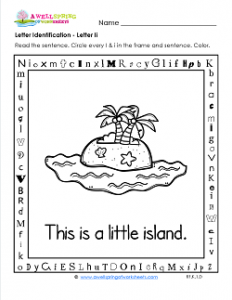 It’s especially little as it says in the sentence, “This is a little island.” Have your kids find and circle the four i’s in the sentence and the 12 i’s in the frame. There are three on each side. And if they have time, you can have them find and circle the hidden sight word “do” in the bottom part of the frame. Of course, this tropical island needs to be colored. How about some beautiful blues and greens?